If you have outstanding team members, don’t say “Thank you” in a humdrum way. Put some creative effort into your recognition and rewards to make a lasting impression on your staff. When the team has worked long, hard hours, losing sleep to complete an important project, present their bonuses on new luxurious, soft pillows. Include a “free pass” to come in late the next day. When they have sacrificed family time, give them a weekend at a water-park hotel to reconnect and make fun new memories with their kids. When someone has “gone the extra mile,” present that person with a new pair of running shoes or a gasoline gift card. When someone “rocks,” give tickets to a concert or a gift with a gemstone. When an employee catches a critical mistake, present that person with a high-quality red pen. When a leader has cleaned up a mess of a project, return the favor with a gift certificate for a home cleaning service. When you know employees won’t toot their own horns, tweet about their successes. Another way to make your appreciation public: Write a recommendation on their LinkedIn profiles. No matter what your budget, the person’s interests and the level of appreciation you want to show, you can find a unique way to do it. Make matching rewards to employees’ interests easy by including a section on your onboarding forms that asks their preferences. Find more recognition tips in the free Focus On section this month at CommunicationBriefings.com. Take a moment to think about all the people in your workplace: your employees, co-workers, boss and other people with whom you rarely—if ever—interact. Each of those people brings a different personality, learning capacity and communication style to the table. The people around you have led different lives, and their experiences have prompted them to form biases, preconceived ideas and assumptions. Furthermore, they will interpret situations differently. Because of that, you can say the exact same thing to three different people, and each could potentially—and often does—walk away with a totally different understanding of what you said. However, with an effective communication strategy, your team can excel. You and your employees can work together to reach—and even exceed—your goals. And people can be happy at work. 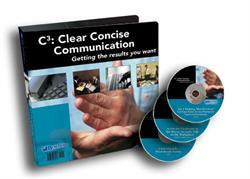 C3: Clear Concise Communication presents you with that strategy. With it, you will learn how to communicate in a direct manner—across all channels—ensuring that you get the results you want and avoid the communication pitfalls that can wreak havoc in the workplace. Click here to learn more or to order! This entry was posted in Communication Briefings E-Letter and tagged employee morale, employee recognition, motivation, rewards, Thank you. Bookmark the permalink.